I'm about to ask what I suspect is a silly question. Has anyone every tried cutting up an outboard to use as an inboard. I was thinking of mounting the powerhead in the hull with the shaft running vertically (as a normal outboard). 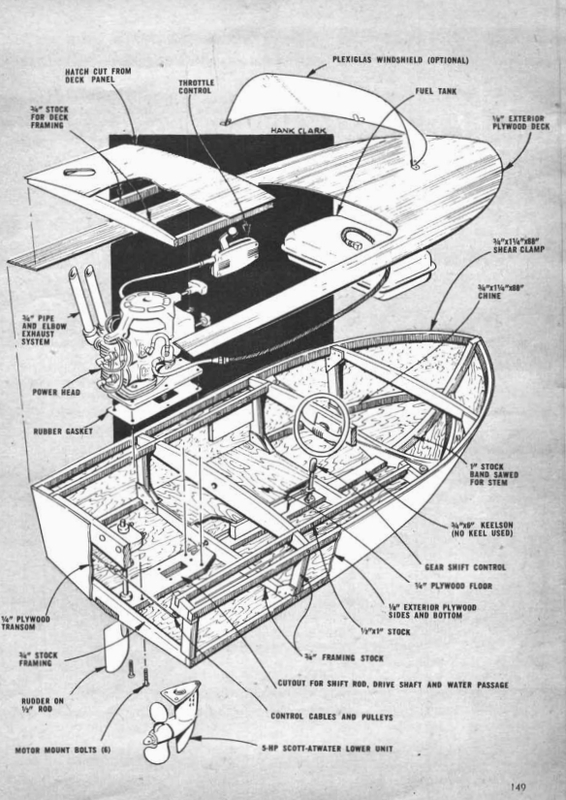 The lower leg would then be mounted under the hull with the drive shaft, water outlet and gear shifter protruding through the hull. The crankshaft and drive shaft on the lower leg could be connected via belt or chain drive. The advantages I see are that outboards are easy to obtain, they are marinised and come complete with a gearbox. Would this be a practical solution? Anyone ever heard of it being trialled? I'm not a gearhead, so can't speak to any of the finer points, but here's some of the downsides I see. 1) outboards are expensive. you're paying a premium to get everything into one compact, self-contained unit, so why break it apart? 2) with an unconventional setup like this, you'd be kinda on your own. I can't imaging many boat mechanics would be willing to work on this. 3) you mentioned that it's already marinised. So are marine inboard engines. I like trying new things, but in this case I feel like sticking with the tried and true methods is the way to go. I'm building a Bartender. It will have an outboard mounted in an inboard well. Mounts just like any outboard. There is a fold down plug that partly fills the well. The idea has been tried before by Fageol, Crofton or Homelite I am not sure which one but it's the same basic motor. They took a 44 cubic inch outboard made an inboard similar to your idea with the lower unit coming out of the bottom of the boat. I think the inboard/outdrives put an end to the idea. If you think about it, the idea may work with a small outdrive. A used outboard in the 100 to 150 hp can be bought for $800.00 to $1500.00 and you would get more hp/lb then a four cycle also a lot less parts and weight. Granted you would have to manufacture all the necessary hardware to make this work. 1)Would the engine be mounted horizontal or vertical? 2)If the engine is mounted horizontal a new intake manifold may be needed? 3)Would a OMC V4 be better than a Mercury straight 6? 4)Since engine weight is inside boat and not on transom. How small can boat be, would it fit in the Bullet? I think Force did an I/O with an outboard power head. It wasn't very popular. But, it was compact. OMC had one used in sailboats called naturally a "Saildrive" They had all kinds of problems with water leaks and were a bugger to winterize properly. I have seen some older factory built boats forsale with their original 90hp 2 stroke inboard engines that look to be based on an outboard (outboard power head). 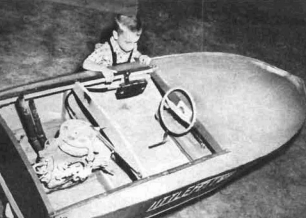 The outdrive portion appeared to be a conventional inboard/outboard set up like those used on many modern boats with 4 stroke automotive design based engines. The boats look like they were made in the late 60's early 70's. In the late 1950's Mercury bought/ sponsored a race car. The engine blew, and they switched it to a Merc powerhead ( Mark 55 IIRC ) run on it's side and cooled it with a radiator, so it could be done, but at a large cost.. The Force "L" drive was a configuration that I think only Bayliner used. Not a true I/O. The powerhead mounts to the midsection the same as a regular Force outboard but the leg runs thru the hull.. If a 2 stroke I/O is the goal, something like a Subaru 360 engine would be ideal. other than a saildrive, I dont see anything advantagous there. You take a outboard powerhead and mate it to a 'straight inboard' propshaft. Im saying do this with like a 200hp Merc powerhead moving a TinyMite. I was worried about excessive vibration and water level (difference in back pressure and possible flow into the exhaust) when I cut the down leg and hard mounted an 18HP Evinrude into my build. I just launched the other day, and granted I only have a couple of hours so far, I was very pleased with the engine performance. I toyed around for a couple of years looking at Sail drives, 4 stroke "lawnmower" engines (vertical and horizontal) Pulley mounted connections as you've described, before I finally decided to go with a "shortened" out board. So far I'm happy with my decision. If it turns out to be a problem i guess I'd look at a small atomic four and a vee drive next for my application. Good luck. Sorry... I'm in the middle of a glue up and my mind wanders a bit these days.... one thing I forgot to mention is cooling water. The outboard power head is pretty intricate in it's design as it mates to other surfaces. Keeping the cooling water path intact can be a bit tricky (just something else to think about). I've decided to take the easy route and bought a set of plans for a Flying Saucer (outboard powered) as opposed to the Tiny Might. The HP potential is much less with the FS, but it will be enough to do what I want to do.